For many, the first thing that comes to mind when they think of oil spills is an image of great big oil sheens in the middle of the ocean, tarballs washing up on beaches, and photos of oiled wildlife on the internet. Marine pollution on the whole might also bring to mind an image of sandy beaches littered with plastic bottles and other marine debris — or perhaps even a “garbage island” floating out in open sea. 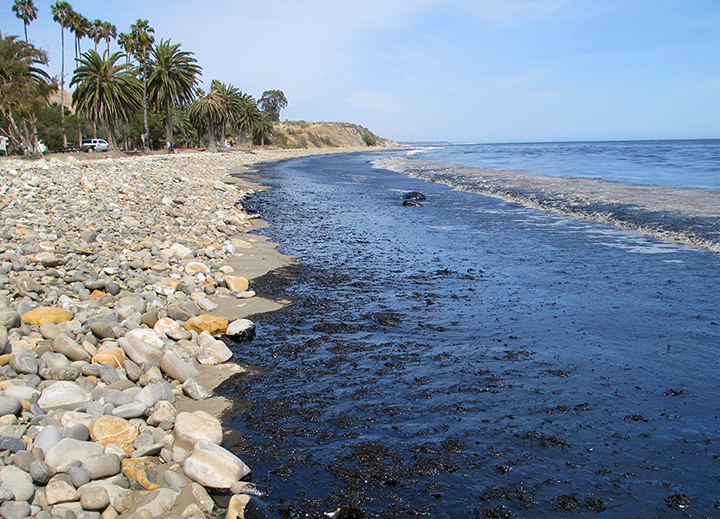 Oil on the beach at Refugio State Park in Santa Barbara, California, on May 19, 2015. Image credit: U.S. Coast Guard. Behind each of these images is a deeper level to the complexity of the issue of marine pollution — a social one. The effects of marine pollution go beyond environmental issues. They encompass a wide range of impacts, including economic, mental and physical health, cultural, social, and governmental. The human dimensions of oil spills are widespread. The most obvious impacts come in the form of acute and chronic health problems and physical injuries. But marine pollution can even affect entire communities — changing their social behavior, altering the local economy, and threatening their natural and cultural resources. On an economic level, the impacts can be anything from a fisherman’s temporary loss of income to a complete loss of livelihood. It could even be an industry-wide disruption of normal economic activities. For the Native American tribes who have cultural ties to their natural resources that go beyond that of simply recreational activities, marine pollution can pose a threat in the form of a degradation of natural heritage, interruption of customary activities, loss of identity, violation, damage, destruction of cultural sites, and a change in values. An altered experience and use of the natural environment is also an important social aspect to marine pollution. An oil spill or another pollution incident can affect public access to natural environment and infrastructure — including a negative experience or even a loss of recreation opportunity. It can also impact the quality and availability of housing, as well as the quality of community infrastructure. On a governmental level, many marine pollution incidents result in crime enforcement, hearings, and new legislation or regulation. They can also affect the participation, preparedness, and capacity of response and planning. Together with federal, state, tribal, industry, and academic partners, NOAA’s Office of Response and Restoration looks to social science research to inform our capacity to respond to incidents, assess the damages, and restore resources wherever possible and compensate the public through other restoration projects when it isn’t. This month, OR&R will be taking a closer look at the relationship between humans, the environment, and the various forms of marine pollution that impact them both. Coming up next, find out about how historic industrial pollution in the Great Lakes has affected a way of life for native communities. Keep an eye out for more upcoming blogs on our website here.